Re: Who's going to Phoenix? How much do you want for them? If you're just giving them away, I might be interested. Are they all in mint condition? I listen to his show sometimes. I pay $2.99 per month for the podcast downloads, so I'm always at least one day behind. I should have updated sooner, but the results of the Top 50 Genre Themes Countdown at TuningIntoSciFiTV.com have been out for a while. Forgive me if this has been a topic before, but I'm wondering how much everyone liked Babylon 5's opening themes and, since they're different every season, how they would rank them. Check out this special April Fools edition of the Two-Minute Time Lord podcast, a podcast usually about Doctor Who. 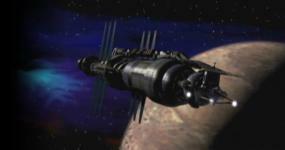 This edition is a review of the B5 episode "Severed Dreams" from 01 April 1996. I've watched it all season. I like it. I think I'm most impressed with the visual style of it. I love the look of Caprica City. Me too!!! Jack can be frustrating sometimes. I am definitely still watching. I've been enjoying it. I got frustrated way back in season 3, but it picked up in season 4. I'll take one if there are still some left. Let me know about postage and payment method. Thanks. He may have said this elsewhere too, but if you're talking about Heroes Con in Charlotte, NC, about three summers ago, I was there too and also remember him saying the same thing. This is precisely how I feel. There are so many things I have not liked about seasons 2 & 3.0 so far that I really ought to give it up, but curiosity and hope keep making me tune it one more week. I received volumes 14 & 15 today. I might have to read the original story arc chapter again and let it sink in before commenting further. I'm not much of a DVD watcher, so for me, re-watch value has more to do with a movie shown on cable TV, during the rare times I'm surfing channels or my TiVo picks up a movie for me. "Vir! Intelligence has nothing to do with politics." "If you see anything this big with eight legs coming your way, let me know. I have to kill it before it develops language skills." Was Sept. 9 Dead Zone ep missing an act??? Did anyone else catch the September 9th episode of The Dead Zone? If they were to dock in a stationary section, wouldn't that make it difficult for people and cargo to transition over to the rotation section? Good idea. I looked, and it's actually disc 6 of season 1. Re: Does anyone watch Jericho? Not sure I can say much that hasn't been said already, but basically, I would agree with all those that like it. I thought the same thing recently. Also, aren't there several logic errors in 2010 as to how it regards zero-G and artificial gravity by rotation? I just saw X-Men 3, and to be honest, I simply don't know what to make of it. Problems with Cafe Press ??? Re: Problems with Cafe Press ??? Well, they did it again. I order two copies of Volume 6, and they only sent me one. That's the *third* time. Wow, that's scary, Joe. When I forwarded the link for this article to a friend at work last week, those same two names came to my mind too. Jessica Simpson also came to mind. Sorry, I guess I was taking for granted that everyone had heard about it.